French chemist, Antoine-Laurent Lavoisier (1743-94), pictured here with his wife, Marie-Anne (1758-1836), is famous for recognising and naming oxygen and hydrogen, and describing their significance in combustion. He is also famous for changing chemistry from a qualitative to a quantitative science. Painted by the artist, Jacques-Louis David (1748-1825), this portrait was commissioned in 1788 by Marie-Anne, who was also a chemist and Lavoisier’s laboratory companion. 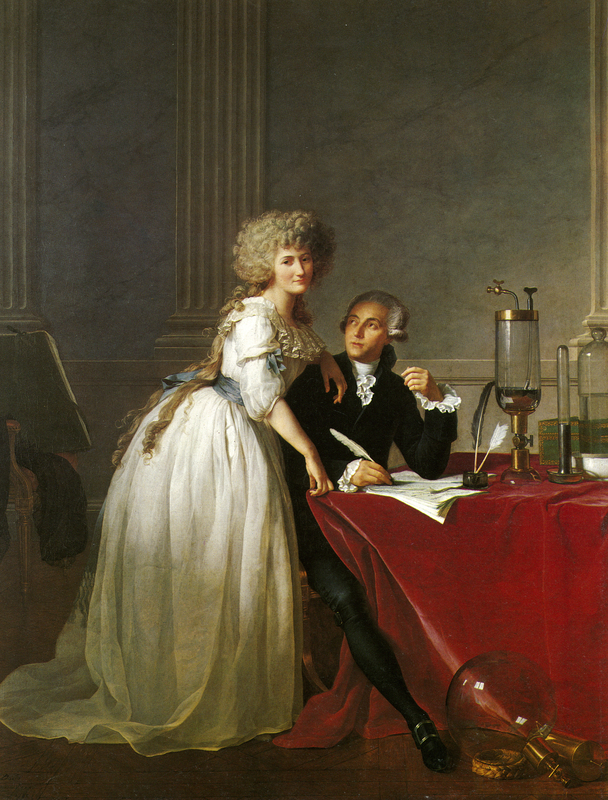 She was an important collaborator in Lavoisier’s research, and their close relationship is depicted in the portrait. On the far left is a folio of Marie-Anne’s drawings (David was her drawing teacher), in which she recorded much of their work. Antoine Schnapper, “David,” ourheritage.ac.nz | OUR Heritage, accessed April 22, 2019, http://otago.ourheritage.ac.nz/items/show/11079.